Several years ago I had a very profound experience, a conversion of sorts. Growing up in an Irish Catholic family I have memories of going to church that go back to before I could speak. Every Sunday the whole family, all eight of us, would sit right in the front pew, we attended CCD faithfully and received all of the sacraments of initiation. But I was a product of my generation where we were not taught the depths of divine truth, rather we were taught a surface “feel-good” religion. So, needless to say, when I became a teenager, I stopped practicing the faith of my youth and adopted the basic secular humanistic tenet that permeates society today. After a while I learned that this philosophy doesn’t deliver what it promises — peace, harmony and that human beings are capable of being ethical and moral without religion or God. So in my twenties I began a slow quest for peace in my life, which I was able to find from going to Mass on Sunday and singing with the choir. There is a line from Isaiah 55:11, which tells us the word of God never returns to him void, it always accomplishes its purpose. So a few years after listening to scripture at Mass and hearing some good homilies on the “meat and potatoes” of our faith, I began to get involved in different ministries of the Church. One very interesting homily, however, on the importance of sacramental confession proved to be life changing. Father spoke about how it is Jesus we meet in the confessional. He helped us to understand that while the priest is present, it was Jesus to whom I was confessing, who is truly present in his sacraments. The priest even gave out an examination of conscience after Mass. Up to this point, I would just confess straight to God in sorrow for sin and feel forgiven. But then I found myself doing the same stupid things over and over. Of course I would feel awful (because sin always eventually makes you feel bad), so I would confess straight to God, feel forgiven, but then turn around and do the same stupid things again. It seemed I couldn’t break this cycle of repeated sin. Being frustrated with myself, and after hearing that homily on confession, I felt a need to confess my sins to a priest. That day changed the course of my life. I walked into the confessional, but someone else walked out — or rather, I left someone there, someone I didn’t want. The Lord flooded me with sanctifying grace that day. He gave me a profound hunger to learn the faith I instinctively knew I hadn’t learned, and to do holy things. I was also delivered from the very desire to participate in my past sinfulness — a free gift from God. And for the first time, I experienced deep inner peace and overflowing joy, so abundant that I think I wore a smile on my face for two weeks. Prior to confession, the readings that week were about the Prodigal Son, the parable of God the Father’s love for the repentant sinner. What a loving and tender God we have who has such patience for his children. Just as the father in the parable, he waits for us to turn our hearts to him. And when we choose to turn back to him, he sees us in the distance and meets us on the way, clothing us with grace and mercy. This is what we have waiting for us if we have genuine sorrow for our sins every time we go to confession. My prayer for you as we prepare for Lent and Easter is that you avail yourself to the gift of divine grace and mercy through the sacrament of reconciliation and experience, as our Lord Jesus promised, the peace and joy this world cannot give. “He first loved us”( 1 John 4:19), then there we were. Each newly conceived human person is so valuable to Our Lord that He desired the whole human experience, becoming a single celled human individual in His Mother’s womb. Our well-being so important to Him that He assigns an angel to remain with us throughout our whole life, to guard, protect and guide us. His love is so complete that He has chosen to be with us intimately by becoming our food in the Holy Eucharist! What more can we say to articulate the great God-given dignity that is ours?! The “right to life” is primary to forming a just society, one that upholds the dignity of every human person from the moment of conception until natural death. Children who are raised in a loving, stable and nurturing environment, where children are welcomed as a gift, are more well-adjusted, intelligent and successful adults. A society that makes the distinction of who is worthy of care or worthy of life is one that destroys the very essence that will give it a stable and successful future. As the Lord God, the Creator of all things holds each one of us in such great esteem, we, as followers of Jesus Christ need to be like-minded. To change our society, we must change our own hearts. Let us make it our aim and goal to uphold the dignity of every human person, from the first moment of conception until natural death. Whether walking our dogs around the neighborhood, walking to the Mission, gardening in front of the convent or shopping in one of the local food stores, people can see us and remember God.. And if we were nice to them, and this we take great care to do as a way of living our vow to uphold the dignity of every human person, they know God loves them. Very often, people ask us to pray for them, so we do, even in the midst of a busy shopping center. You see, it is not about the individual sister, but about Who we represent. However, it is truly the habit of penance, as was evidenced one day while in a local food mart. A man who was very inebriated and "cussing up a storm," used the Lord's name in vain. I very gently said, "Please don't use the Lord's name in vain." He responded by heaping upon me a litany of "cusses" and appeared very agitated and aggressive. Understanding that I may be put in a position to "take a hit for the Lord," I knew that this man, whom I had never met before, was not angry with me, but angry at Who I represented. Consequently, the man was ushered out of the store by the people who came with him, after the store manager turned to call the police. “The Church must always seek to make her presence visible in everyday life, especially in contemporary culture, which is often very secularized and yet sensitive to the language of signs…consecrated persons, called as they are in every situation to bear clear witness that they belong to Christ…The habit is a sign of con-secration, poverty and membership in a particular Religious family. 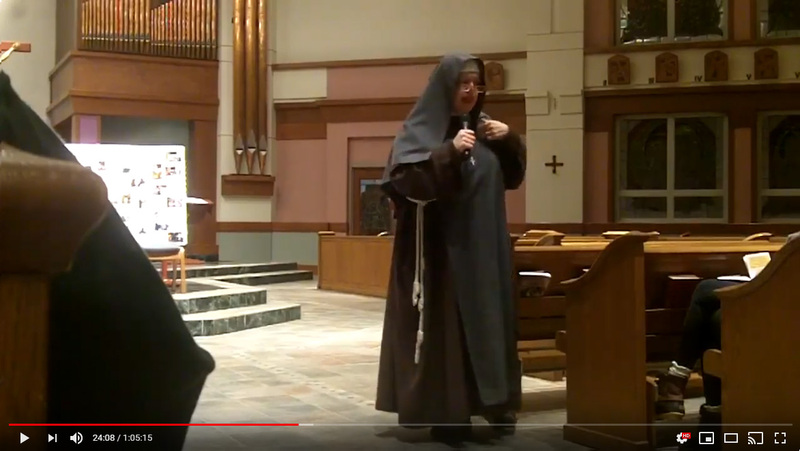 On Oct. 7th, 2011 Sr. Clare Marie of the Holy Eucharist was invested in the habit of our community, as she entered into the Novitiate stage of formation. 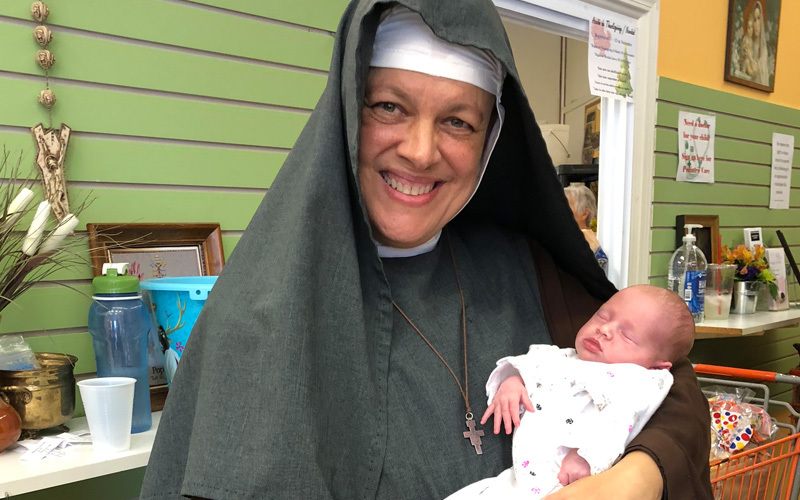 At her Investiture ceremony, Sr. Clare consecrated herself to Our Lady of Guadalupe, the true Superior of our community. She received the medal of Our Lady of Guadalupe as a sign of her consecration. She was then tonsured, a total rejection of the vain things of the world, by willingly offering her one crowning beauty before she received our habit. We are often asked why we wear a habit. The answer: We choose to! Our Novices are invested with a white scapular, a sign of purity and of her consecration to Our Lady as well as a commitment to live out her vocation with the Blessed Virgin Mary as her role model and intercessor. 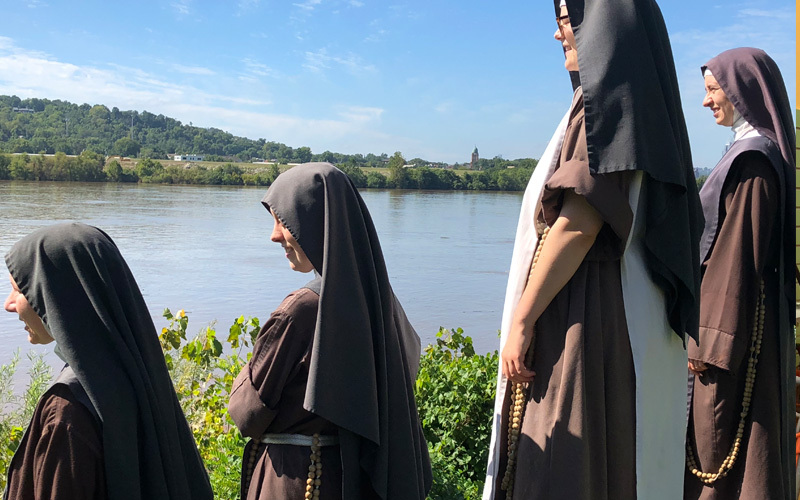 The veil is our helmet of salvation and hope, a sign of her humility and unfailing obedience and of her firm intention to turn her eyes away from foolish vanities.